When you see the Ships Free logo, that item Ships Free with no minimum quantity or dollar amount everyday! Unique hydrophobic layer between the microfiber and the sponge prevent excess absorption by the applicator. Two-toned for easy differentiation from standard applicators without the product saver technology. Available in three different sizes: mini, thin and thick. Size: 5" x 3.5" x 1." The main complaint about microfiber applicators is that they absorb too much products. Over the past few years as expensive coatings have taken over the industry, the complaints have only grown. 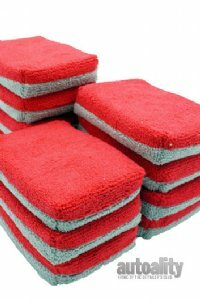 Microfiber applicators make coating product application easier, quicker and more efficient, but coatings typically have a lower viscosity so they soak through the microfiber to the sponge, waisting valuable product. Autofiber's solution to this problem is the Saver Applicator line. Autofiber has added a layer of hydrophobic material between the microfiber and the sponge. This prevents excess product from soaking through the microfiber into the sponge. It also limits excess product buildup which can become gummy and tacking if you are using them to apply a coating. The two-tone, blue/grey, color is only to differentiate them from standard single color microfiber applicators which don't have the product saver technology. The two sides function exactly the same. Autofiber Saver Applicators are available in three different sizes: mini, thin and thick.